That fish is AMAZING looking. I'm never in this part of town. I have to figure out a reason to get there. For some reason, this makes me think of the opening credits for the Flinstones. Almost prehistoric drive-in huge. Thanks for sharing. My favorites from tonight were the crispy pork belly po boy, burger with merkts cheese, and truffle fries. The fries were thinner than I had imagined but I still enjoyed them. The sweet potato fries were great too. I was mad at myself for lack of funds in my checking account when I saw the fish tacos being prepared. Next time. Awesome food, aggressively seasoned. Definitely consumed more than the federal government's daily recommended sodium intake (~1 tsp?!?!). Crispy pork belly po boy. 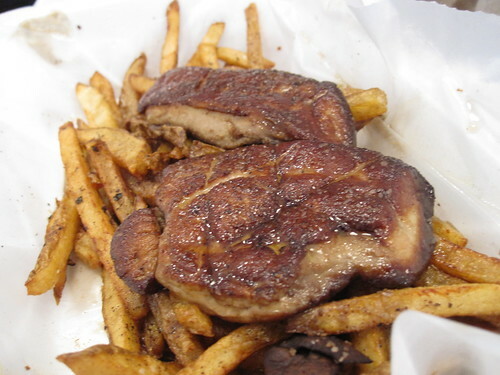 Seared foie gras and fries. Stopped by Big & Little for lunch today, my first visit in a while, though I generally make it there at least once or twice a month. Boy am I glad I went. I have a new favorite sandwich. 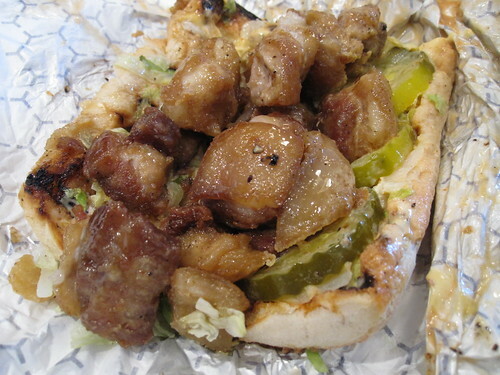 They have some new items listed on their specials board, including this pork tenderloin po-boy. I grew up downstate, where you can walk into any tavern and order a tenderloin sandwich (the famous breaded pork tenderloin discussed at length elsewhere on this site) and though I didn't see that really translating directly to a po-boy at Big & Little, I still wanted to see what they did with it. It is nothing like the BPT. This was their regular po-boy roll with their chili aioli, diced onions, pickles, and a generous pile of smaller (by which I mean not the hubcap-sized pounded flat BPT rendition of pork tenderloin; they were bigger than bite-sized, each one was maybe a 2 to 3 biter?) battered and perfectly fried pieces of pork tenderloin with a sparse lattice of barbecue sauce drizzled over the top (I believe they said they were using sweet baby ray's and the flavor bore that out). I'll admit that it was a little unwieldy to eat but all the components were in perfect balance, the pungency of the onions, the sour crunch of the pickles, the tender delicious meat, the creamy heat of the aioli, and the little hit of sweetness from the barbecue sauce blending into the chewy roll, its interior surface slightly charred from the grill. Fantastic. Tony says he likes it way too much to stop making it so it may make the regular menu, but don't let that stop you from getting there and trying it asap! I will keep this simple: Made my first visit last week and instantly became my #1 Burger of All time (. . ok. . tied with Paradise Pup, and a second visit will determine the title. . or will it?). I was literally moaning eating that burger. I'm still thinking about it 6 days later. Crab tostada was perfect balance of crab and bright lime without being a sour mess. It was refreshing and "uplifting" - I'm not sure what that means as far as food, but that's what it made me feel - uplifted. I can't type anymore. What else is there to say - this place is heaven. After a many-month (7 or 8, I can't recall) posting hiatus, a recent stop at Big & Little's was just the kick I needed to wake up from hibernation. The crab tostada & grilled shrimp taco were as good as always, and the sweet potato fries had just the right amount of crispiness, sweetness, some of that almost-al-dente bite, and were nicely salted. But this has all been mentioned many times over in this thread. There was one interesting item on the specials board this past weekend: softshell crawfish po' boys for $9. I mentioned that I'd never tried softshell crawfish, and Chef Tony ("Little") brought one out to show me, and said they were sweeter than softshell crab, and pretty rare around these parts - he'd recently had them flown in. However, he stated emphatically that it's not a very filling po' boy. Even with the knowledge that it might be skimpy, I still had to try it. What I received was a heaping, two-hands-required po' boy just stuffed with eight or nine perfectly fried, sweet, succulent crawfish and just the right amount of remoulade (added a nice zing, but didn't run down my arm & drip off my elbow). With a few healthy dashes of Texas Pete thrown on for good measure, I was a very happy guy. If this is Chef Tony's idea of "not very filling", I would be very amused to see what monstrosity he considers to be "generous" or "hearty", because this sandwich left me stuffed. I may have mixed up the price with the softshell crap po' boy...one of them was $9, the other was $14. Earlier this week I returned to B&L for the first time in a couple months, even though I live close by and regularly crave their food. On this particular visit, I tried the softshell crab po' boy for the first time, along with an order of fries + merkt's (not the first time). The po' boy was served open-faced on nicely toasted/buttered bread, with the fried softshell crab gloriously displayed atop a bed of lettuce. There also was a tasty, zingy remoulade coating which added just the right touch of flavor. I would have liked tomatoes as well, but all in all it was a fine sandwich. I would absolutely order it again, although now the crawfish po' boy sounds tempting, as does the shrimp po' boy. Just for reference, the soft shell crab po' boy is $9, while the crawfish po' boy is $12. 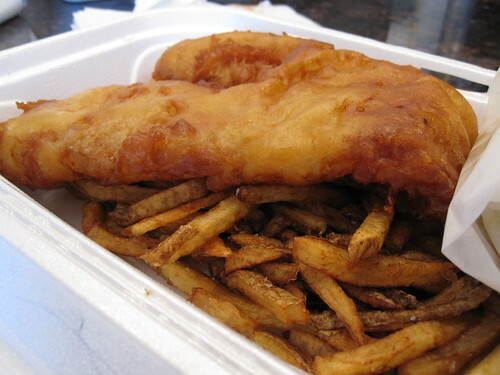 The fries were good, not great, because I prefer them crispier than they serve them at B&L's. It is always a pleasure though to watch them prepare the fries as they salt them in a huge bowl right before your eyes. The Merkt's is a must-have add-on but I've yet to order the truffle fries, so maybe I will give those a shot next visit. This place is no longer cheap-eats, however. Total for my meal which included an IBC root beer was over $16 and I was worried I would still be hungry after I finished (this was not the case). The Merkt's cup for $1.50 seems kind of excessive, especially when I never finish the entire portion of cheese. I believe other items on the menu have increased in price recently, such as the fish & chips, which once were $9 and now cost $12. But I'm more than happy to spend under $20 for a meal of this quality. As always, it was stifling hot in the restaurant and there is no longer a picnic table to dine at outside. When I asked where it went, Gary explained that they no longer have access to that outdoor area, but then came the big news of the day. Big & Little's is moving! They have acquired a space just north of the current storefront at 858 North Orleans, where Zaiqa Indian restaurant formerly operated. Look for an annoucement soon and for the move to take place in the next few months. Gary said the new space is much larger and they will have outdoor tables in their own parking lot. Very excited for these guys and wish them nothing but continued success in their endeavours. Soft shell crawfish po'boy was $14.50 today. I bought it. It was good. And the new location is where? gullit wrote: And the new location is where? Lerdawg's post upthread has the information. Which is most definitely not North of the current location, as stated by the referenced post. Correct. I was just extracting the new address (south of the original location) from Lerdawg's post above and make no guarantees of his directional accuracy. in other words: just north of 858 N Orleans, maybe? I posted a Google map of the respective locations yesterday. It was inexplicably deleted. Suffice to say that the posted new location is a little over two blocks south of the current location, on the west side of Orleans, and across the street from CHIC. Maps are a Good Thing. To whoever deleted it, keep in mind that everyone who reads LTHforum is not a Chicagoan, and accurate addresses and directions are a must. I meant south of the current location, my bad. Thanks. What will I do with the rest of my day/week/year, now that this issue has been resolved? Didn't you once make a lunch run down to Cemitas Puebla when you still had your office in HP? For B&L, I'll plan a meeting with a nearby customer or supplier. I've only been once, back in May I believe, and had the burger with Merkt's and grilled onions. 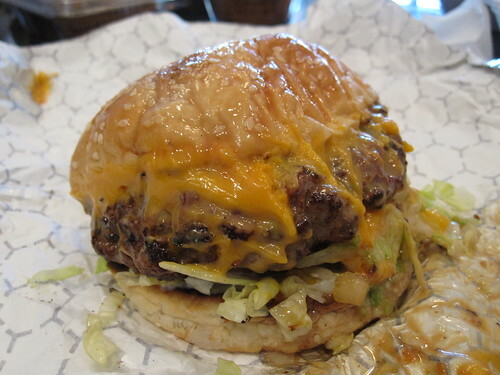 It is easily the best burger I've had in Chicago (though, admittedly, I've only lived here for a few years, and still have a lot of burgers to try). Next time I go, which will be damn soon, I'm gonna have to try some of the seafood. Whenever I find a delicious burger, though, I have a big problem ordering anything but. Excited to check out their new digs. Does anyone know if they allow byob? TIA. titus wong wrote: Does anyone know if they allow byob? TIA. Give them a call. We live a few blocks away and for a moment I was the Foursquare Mayor, but I never saw anyone consuming alcohol there. I think there is something admirable in BIG & little's seeming dedication to coming up with new sandwich ideas that are both a) irresistable to me, and b) way too much food for me to eat in one sitting. Though probably not in my inability to just say no. That is their buffalo bleu cheese pork sausage po boy. I think they may have finally come up with something that I won't finish. Digging into this at my desk, I first wished I had more hot sauce. Then I wished I had a fork and knife. Then I remembered that there are plastic forks and knives in the kitchen, and a bottle of Frank's* in my desk drawer. This thing, like several of the other sandwiches I've ordered from this place, is excessive. It's a good combination, hot sauce + bleu cheese is of course a classic but the pork sausage plays very well in that mix, though maybe not quite as well as a nice crispy chicken wing would. I think there's a good sandwich here. I just think this one has... ratio issues. I'm sitting here trying to finish it, as it slowly disintegrates its foil wrapper. I'm promising myself to skip a few meals in the near future. ** I'm trying. I'm not sure I'm up to the task. Though they are still at the old location, I spoke to Tony while waiting and he says they're going to try to be up and running at the new address by Monday. I got the impression that was a very optimistic goal though. ** or, let's be honest, at least skip having seconds. Yeah, last I'd heard they were really, really desperately hoping to be in the new space by the time the DD&D episode airs in on 11/7. Sounds like they're still pushing up against that deadline. I'm also a fan of the samurai whitefish taco, which is a total bastardization of a dozen different cuisines, but delicious. Sadly, I didn't see the mahi taco on the menu last time we were there. New location? Where are they moving too? JLenart wrote: New location? Where are they moving too? Lerdawg wrote: Big & Little's is moving! They have acquired a space just north of the current storefront at 858 North Orleans, where Zaiqa Indian restaurant formerly operated. Look for an annoucement soon and for the move to take place in the next few months. Gary said the new space is much larger and they will have outdoor tables in their own parking lot. Very excited for these guys and wish them nothing but continued success in their endeavours.